The revitalization action includes cleaning and arrangement for beauty and controlling is carried out in the homestead athlete area, North Jakarta.
" 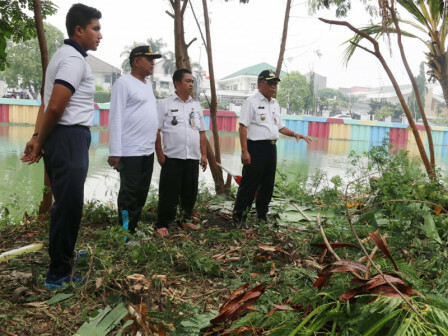 Hopefully, all will be complete before on July 22"
North Jakarta Mayor, Husein Murad said, cleaning is executed in urban village areas that became the track towards homestead athlete such as Sunter Agung Urban Village, Sunter Jaya Urban Village, and Pademangan Timur Urban Village. Especially for densely populated area around Sunter Selatan Lake, Sunter Jaya Urban Village, he said, arrangement is carried out by painting the citizen homes become kampung warna warni (colorful village). "We repair the unworthy homes around Sunter Lake Police Station. The sidewalk in the location is turned into a plaza with conblock," he told, Wednesday (7/4). In addition, greening is also done along the banks of Sunter Selatan Lake. The garbage shelter located behind the police station had to be closed down. The shelter location was moved to the ex-Sunter SPA in opposite of the BMW Park, until the Asian Games ended. "Hopefully, all will be complete be fore on July 22," he said.